Tools for treating Hodgkin Lymphoma (HL) with radiation therapy (RT) have proliferated rapidly over the past two decades. Innovations are principally divided into two categories: decreasing target size and improving treatment delivery. Progress in the former is reflected in the progression from extended-field RT (EFRT) to involved-field RT (IFRT), and more recently from IFRT to involved-node RT (INRT) and involved-site RT (ISRT). The therapeutic ratio is enhanced by using modern imaging modalities and knowledge of HL patterns of spread to minimize the volume of tissue irradiated while maintaining excellent disease control.1-5 For treatment delivery, intensity-modulated radiation therapy (IMRT), respiratory management, and proton therapy (PT) are promising technologies that may further reduce toxicities beyond shrinking targets alone. This article will assess these three delivery techniques as they pertain to HL management. IMRT is commonly used in general radiation oncology practice in several varieties including static multileaf collimator (subsequently referred to as IMRT), helical tomography (HT), and volumetric-modulated arc therapy that can consist of a single arc (VMAT) or multiple arcs (B-VMAT).6,7 Although each type of IMRT is unique, the principal dosimetric hallmarks of IMRT relative to 3D conformal RT (3DCRT) include higher conformality and better sparing of prioritized organs at risk (OARs) at the expense of greater low-dose bath. It is not guaranteed, therefore, that IMRT is always superior to 3DCRT for treating HL. Given the relatively low doses used in HL RT, it is unclear whether the absolute difference of dose to OAR using IMRT vs. 3DCRT is clinically meaningful. Furthermore, conscious sparing of one OAR might be achieved at the cost of increased dose to other OARs. A full review of the literature on this subject is outside the scope of this review article but is well summarized in a recent review by Maraldo and Specht.8 Examples of 3DCRT and IMRT treatment plans are provided in Figure 1 and Figure 2, respectively. Due to favorable disease control rates and latency of toxicity, many studies have focused on dosimetric comparisons of IMRT vs. 3DCRT as a proxy for anticipated clinical outcomes. The Institute Curie in Paris has investigated the utility of IMRT for mediastinal HL. In 2014, this group published a dosimetric analysis of 3DCRT vs. HT for 10 female patients with early stage mediastinal HL.9 HT resulted in significantly lower maximum dose to critical structures, including spinal cord and breast, as well as improved cardiac sparing, but increased low dose exposure to the breast. They also published the outcomes of 69 patients with stage I-III nodal mediastinal HL and NHL treated with RT.10 Forty-nine patients were treated with 3DCRT and 20 were treated with IMRT, all under free breathing conditions. Local control was consistent with modern outcomes, with 1 local recurrence in the IMRT group and 5 in the 3DCRT group. Acute toxicities were mild. Three patients in the 3DCRT group experienced late toxicities compared to none in the IMRT group, and dosimetric comparison of the two radiation delivery techniques demonstrated similar findings as their previous study, accomplishing better conformity and high dose sparing with greater low dose bath in the HT group. The median follow-up for the IMRT group was only 10 months compared to 46 months for 3DCRT, precluding any meaningful insights into HT’s impact on late effects. However, this institution’s experience is valuable in demonstrating feasibility and mild acute toxicity with IMRT technique. These results are concordant with the results of Filippi et al who reported the outcomes of ISRT IMRT vs. 3DCRT for 90 patients with early stage HL of the mediastinum.11 Grade 2 acute toxicity was significantly lower in the IMRT group (9.8%) vs. the 3DCRT group (24.5%) (p = 0.043). Each group had one patient experience relapse, although median follow up was longer in the 3DCRT group (52.4 months) than the IMRT group (24.1 months). Koeck et al analyzed dosimetric features of 3DCRT and IMRT for IFRT and INRT.12 They found that using INRT reduces OAR radiation exposure most significantly, and IMRT can be used to further spare select OARs such as heart and lung at the expense of increased dose to lung and breast. Goodman et al demonstrated that IMRT could reduce mean heart and lung dose relative to 3DCRT or conventional RT; however, lung V20 was greater in IMRT plans than in conventional plans.13 These studies demonstrate promising early results, although longer follow up is required to determine whether late toxicities match dosimetric predictions. There is still uncertainty regarding the potential for increased secondary malignancies with IMRT. Hall and Wuu cautioned that the transition from 3DCRT to IMRT could increase secondary malignancies due to larger volumes of normal tissue exposure as a result of an increased number of fields and greater radiation leakage from modulated fields.20 They reasoned that the transition to IMRT could be responsible for second malignancies in 0.75% of surviving patients in general. These concerns have been recapitulated in the context of mediastinal HL. Schneider et al estimated second malignancy rates for free breathing (FB), deep inspiration breath hold (DIBH), 3DCRT, and VMAT for INRT using an Alderson phantom.21 The lifetime attributable risk (LAR) was calculated for each combination of these techniques for breast, lung, esophagus and stomach. Whereas DIBH 3DCRT was associated with an 8% to 24% reduction in LAR for these sites compared to FB 3DCRT, DIBH VMAT was associated with a 7% reduction in stomach LAR and up to 104% increase in LAR for the other organs compared to FB 3DCRT. Similar findings were reported by Weber et al, who performed comparison IFRT and INRT plans for 3DCRT, IMRT, and VMAT to estimate the excess relative risk (ERR) of thyroid, lung, and breast cancer with nonlinear and linear models in female patients.22 For INRT radiation therapy, the use of either IMRT technique increased the ERR with a linear model; however, the opposite was seen with a nonlinear model. Other studies have also shown that using IMRT for cardiac sparing is associated with increased dose to the breast.23 While it is difficult to draw firm conclusions from these small studies, it is certainly possible that IMRT may be associated with a heightened risk of secondary malignancy. However, the absolute increase in secondary cancer risk is likely modest and this must be weighed against the ability to spare prioritized OARs. Ultimately, the decision regarding technique must be individualized. For many anatomic sites, FB simulation may be sufficient for reproducible daily RT. For mediastinal fields, however, tumor position can vary significantly with the respiratory cycle. This motion was of lesser concern in previous decades when large extended fields delivering AP/PA were de rigueur. However, in the modern era of reduced volumes with ISRT and INRT, there is higher risk of a marginal miss. A variety of solutions have evolved to account for and manage respiratory motion for mediastinal lymphomas. One can obtain a 4D CT scan to generate an internal target volume (ITV), or use respiratory gating to treat at end inhalation or exhalation. One technique that exploits physiology to reduce lung and heart dose is DIBH, which can be active breathing coordinator (ABC) assisted.24 These respiratory management solutions can also be used in conjunction with other advanced delivery techniques such as IMRT. Several groups have reported dosimetric analyses of these respiratory techniques in the context of mediastinal lymphoma. Paumier et al reported a comparison of FB and DIBH INRT IMRT plans for 28 patients with early stage HL and mediastinal involvement.25 They noted similar PTV coverage and 15% to 20% reduction of mean heart dose, mean lung dose, and lung V20 overall using DIBH compared to FB, and 26% to 50% reduction for upper mediastinal disease. Prospectively, Petersen et al published the results of a phase II trial of DIBH vs. FB INRT for 22 patients with early stage HL.26 Patients were simulated with FB and DIBH and were planned with 3D conformal RT (3DCRT) and IMRT techniques. Each patient was treated with the technique that afforded satisfactory tumor coverage while minimizing doses to OARs. Nineteen (86%) patients were treated with DIBH, and 12 (55%) were treated with IMRT. The group then conducted a dosimetric analysis of FB vs. DIBH and 3DCRT vs. IMRT to deliver INRT for 22 patients with early stage mediastinal HL to estimate the risk of late effects such as myocardial infarction or secondary malignancy using these techniques.27 Each patient was planned on DIBH and FB simulations as well as 3DCRT vs. IMRT. Overall, the risk estimates showed a greater difference between DIBH and FB (favoring DIBH), while differences between 3DCRT and IMRT were fewer. In addition, 3DCRT with DIBH offered similar advantages to FB IMRT, whereas DIBH with IMRT was advantageous in certain situations such as reducing the heart dose for large mediastinal tumors. One adverse finding associated with the use of DIBH was an increased risk of developing breast cancer. It should be noted that while many risk estimates were statistically significant, the absolute estimated risks were small. For example, the percent risk estimate for myocardial infarction for the best performer, IMRT, was 2.1%, compared to 4.9% for 3DCRT FB (p < 0.001). Even smaller differences were observed for the more global assessment Life Years Lost (0.5 years for DIBH IMRT vs. 0.7 years for FB 3DCRT, p < 0.001). These studies present several consistent messages regarding active respiratory management strategies such as DIBH. DIBH appears to confer significant dosimetric advantages for most patients with respect to many parameters, although it may be less beneficial for young women due to increased breast irradiation. Additionally, DIBH can be combined with other advanced delivery techniques such as IMRT. Proton therapy (PT) benefits from the Bragg Peak, which provides modest entrance dose and sharp dose fall-off at the end of the ion’s path.28 The Bragg Peak is too narrow for clinical applications; therefore, the peak must be “spread out” to treat over ranges sufficient to deliver dose to tumor using techniques such as pencil-beam scanning or passive scattering. These attributes are highly desirable for many clinical applications of radiation therapy, such as when a tumor is close to an OAR, or in a patient with an excellent long-term prognosis in which reducing late effects is critical. This latter aim is particularly relevant for HL. Owing to limited availability of PT centers, there are few published clinical outcomes. As with photon therapy, a rich diversity of imaging set-up and delivery techniques exists, resulting in significantly varied PT plans across facilities. Much of the published literature on proton therapy for lymphoma consists of dosimetric studies. Maraldo et al reported a dosimetric analysis of 37 patients with head and neck early stage HL.8 All patients received chemotherapy and 3DCRT-INRT to 30.6 Gy, with comparison mantle field (MF), VMAT and PT plans generated for each patient. They demonstrated that INRT plans spared OARs more than MF. PT was able to spare some OARs such as the pharynx and larynx to a greater extent than 3DCRT, whereas VMAT plans suffered from an inferior low-dose bath without sufficient reduction of high-dose regions. PT has also been applied to HL of the mediastinum, where tumors are juxtaposed to multiple OARs including the heart and lung. 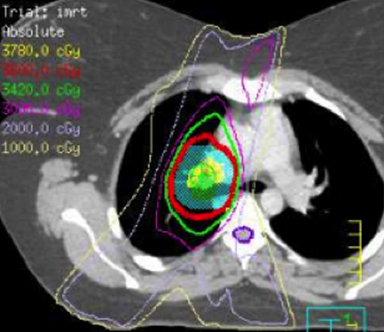 Hoppe et al demonstrated the potential to spare the heart using PT for mediastinal HL compared to 3DCRT or IMRT.34 Li et al reported the outcomes of 10 lymphoma patients who received 3D-PT at the MD Anderson Cancer Center from 2007 to 2009.35 Dosimetric comparison to conventional photon radiation demonstrated lower mean dose to several OARs including heart, esophagus, and lung with PT, although the breast received similar radiation dose across treatment modalities. Conclusions regarding therapy effectiveness are hard to draw from this heterogeneous group of HL and NHL patients who received doses ranging from 30-50 cobalt gray equivalents (CGE). Acute toxicities were mild and all but one patient with refractory disease exhibited disease control at last follow-up. In the most robust series to date, Hoppe et al published the results of a phase II study of involved node PT (INPT) in combined modality therapy for HL.36 Fifteen patients with HL were treated with INPT to 30.6-39.6 CGE after systemic therapy, after dosimetric comparison with 3DCRT and IMRT treatment plans showed superiority for PT. Representative treatment planning for these modalities is provided in Figure 3. Three-year relapse-free survival of 93% was similar to results with photons, and PT was well-tolerated. Small patient numbers combined with the heterogeneous chemotherapy regimens that patients receive may limit our ability to detect differences in late effects between this group and those who receive photon therapy. The modern radiation oncologist has an abundance of delivery techniques to choose from when treating a patient with HL, but concrete evidence supporting the options remains limited. Concerning IMRT and its variants, respiratory management, and particle therapy, dosimetric advantages in one aspect of treatment planning may be counterbalanced by disadvantages. Therefore, the treating radiation oncologist must carefully consider each case, as no optimal solution applies to all patients. In certain clinical contexts, multiple techniques may be combined. Specht L, Yahalom J. The concept and evolution of involved site radiation therapy for lymphoma. Int J Clin Oncol. 2015;20(5):849-854. Yahalom J, Mauch P. The involved field is back: issues in delineating the radiation field in Hodgkin’s disease. Ann Oncol. 2002;13 Suppl1:79-83. Girinsky T, van der Maazen R, Specht L, et al. Involved-node radiotherapy (INRT) in patients with early Hodgkin lymphoma: concepts and guidelines. Radiother Oncol. 2006;79(3):270-277. Specht L, Yahalom J, Illidge, et al. Modern radiation therapy for Hodgkin lymphoma: field and dose guidelines from the international lymphoma radiation oncology group (ILROG). Int J Radiat Oncol Biol Phys. 2014;89(4):854-862. Hoppe BS, Hoppe RT. Expert radiation oncologist interpretations of involved-site radiation therapy guidelines in the management of Hodgkin lymphoma. Int J Radiat Oncol Biol Phys. 2015; 92(1):40-45. Infusino E. Clinical utility of RapidArc radiotherapy technology. Cancer Manag Res. 2015;7:45-356. Yu CX, Tang G. Intensity-modulated arc therapy: principles, technologies and clinical implementation. Phys Med Biol. 2011;56(5):R31-54. Maraldo MV, Brodin NP, Aznar MC. et al. Doses to head and neck normal tissues for early stage Hodgkin lymphoma after involved node radiotherapy. Radiother Oncol. 2014;110(3):441-447. Pernin V, Zefkili S, Peurien D, et al. Can we reduce the toxicity of the mediastinal irradiation using new highly conformal techniques? J Leuk. 2014;2(4):1000154. Besson N, Pernin V, Zefkili S, Kirova YM. Evolution of radiation techniques in the treatment of mediastinal lymphoma: from 3D conformal radiotherapy (3DCRT) to intensity modulated RT (IMRT) using helical tomotherapy (HT): A single-centre experience and review of the literature. Br J Radiol. 2016:20150409. Filippi AR, Ciammella P, Piva C, et al. Involved-site image-guided intensity modulated versus 3D conformal radiation therapy in early stage supradiaphragmatic Hodgkin lymphoma. Int J Radiat Oncol Biol Phys. 2014;89(2):370-375. Koeck J, Abo-Madyan Y, Lohr F, et al. Radiotherapy for early mediastinal Hodgkin lymphoma according to the German Hodgkin Study Group (GHSG): the roles of intensity-modulated radiotherapy and involved-node radiotherapy. Int J Radiat Oncol Biol Phys. 2012;83(1):268-276. Goodman KA, Toner S, Hunt M, et al. 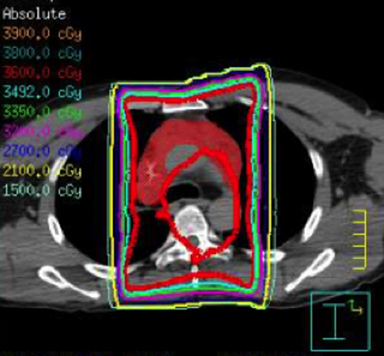 Intensity-modulated radiotherapy for lymphoma involving the mediastinum. Int J Radiat Oncol Biol Phys. 2005;62(1):198-206. Fiandra C, Filippi AR, Catuzzo P, et al. Different IMRT solutions vs. 3D-conformal radiotherapy in early stage Hodgkin’s Lymphoma: dosimetric comparison and clinical considerations. Radiat Oncol. 2012;7:186. Weber DC, Pequret N, Dipasquale G, Cozzi L. Involved-node and involved-field volumetric modulated arc vs. fixed beam intensity-modulated radiotherapy for female patients with early-stage supra-diaphragmatic Hodgkin lymphoma: a comparative planning study. Int J Radiat Oncol Biol Phys. 2009;75(5):1578-1586. Voong KR, McSpadden K, Pinnix CC, et al. Dosimetric advantages of a “butterfly” technique for intensity-modulated radiation therapy for young female patients with mediastinal Hodgkin’s lymphoma. Radiat Oncol. 2014;9:94. Constine LS, Schwartz RG, Savage DE, et al. Cardiac function, perfusion, and morbidity in irradiated long-term survivors of Hodgkin’s disease. Int J Radiat Oncol Biol Phys. 1997;39(4):897-906. Pinnix CC, Smith Gl, Milgrom S, et al. Predictors of radiation pneumonitis in patients receiving intensity modulated radiation therapy for Hodgkin and non-Hodgkin lymphoma. Int J Radiat Oncol Biol Phys. 2015;92(1):175-182. Ghalibafian M, Beaudre A, Girinsky T. Heart and coronary artery protection in patients with mediastinal Hodgkin lymphoma treated with intensity-modulated radiotherapy: dose constraints to virtual volumes or to organs at risk? Radiother Oncol. 2008;87(1):82-88. Hall EJ, Wuu CS. Radiation-induced second cancers: the impact of 3D-CRT and IMRT. Int J Radiat Oncol Biol Phys. 2003;56(1):83-88. Schneider U, Sumila M, Robotka J, et al. Radiation-induced second malignancies after involved-node radiotherapy with deep-inspiration breath-hold technique for early stage Hodgkin Lymphoma: a dosimetric study. Radiat Oncol. 2014;9:58. Weber DC, Johanson S, Pequret N, et al. Predicted risk of radiation-induced cancers after involved field and involved node radiotherapy with or without intensity modulation for early-stage Hodgkin lymphoma in female patients. Int J Radiat Oncol Biol Phys. 2011;81:490-497. Nieder C, Schill S, Kneschaurek P, Molls M. Comparison of three different mediastinal radiotherapy techniques in female patients: Impact on heart sparing and dose to the breasts. Radiother Oncol. 2007;82:301-307. Boda-Heggemann J, Knopf AC, Simeonova-Cherquo, et al. Deep inspiration breath hold-based radiation therapy: a clinical review. Int J Radiat Oncol Biol Phys. 2016;94(3):478-492. Paumier A, Ghalibafian M, Gilmore J, Beaudre A, et al. Dosimetric benefits of intensity-modulated radiotherapy combined with the deep-inspiration breath-hold technique in patients with mediastinal Hodgkin’s lymphoma. Int J Radiat Oncol Biol Phys. 2012;82:1522-1527. Petersen PM, Aznar MC, Berthelsen AK, et al. Prospective phase II trial of image-guided radiotherapy in Hodgkin lymphoma: benefit of deep inspiration breath-hold. Acta Oncol. 2015;54(1):60-66. Aznar MC, Maraldo MV, Schut DA, et al. Minimizing late effects for patients with mediastinal Hodgkin lymphoma: deep inspiration breath-hold, IMRT, or both? Int J Radiat Oncol Biol Phys. 2015;92:169-174. McGowan SE, Burnet NG, Lomax AJ. Treatment planning optimisation in proton therapy. Br J Radiol. 2013;86(1021):20120288. Lambert J, Suchowerska N, McKenzie DR, Jackson M. Intrafractional motion during proton beam scanning. Phys Med Biol. 2005;50(20):4853-4862. Knopf AC, Hong TS, Lomax A. Scanned proton radiotherapy for mobile targets-the effectiveness of re-scanning in the context of different treatment planning approaches and for different motion characteristics. Phys Med Biol. 2011;56(22):7257-7271. Cox JD, Schechter NR, Lee AK, et al. Uncertainties in physical and biological targeting with radiation therapy. Rays. 2003;28(3):211-215. Moteabbed M, Geyer A, Drenkhahn R, et al. Comparison of whole-body phantom designs to estimate organ equivalent neutron doses for secondary cancer risk assessment in proton therapy. Phys Med Biol. 2012;57(2):499-515. Carabe A, Moteabbed M, Depauw N, et al. Range uncertainty in proton therapy due to variable biological effectiveness. Phys Med Biol. 2012;57(5):1159-1172. Li J, Dabaja B, Reed V, et al. Rationale for and preliminary results of proton beam therapy for mediastinal lymphoma. Int J Radiat Oncol Biol Phys. 2011;81(1):167-174. Hoppe BS, Flampouri S, Zaiden R, et al. Involved-node proton therapy in combined modality therapy for Hodgkin lymphoma: results of a phase 2 study. Int J Radiat Oncol Biol Phys. 2014; 89(5):1053-1059. Dabaja BS, Advani R, Hodgson DC, et al. ACR Appropriateness Criteria diffuse large B-cell lymphoma. Am J Clin Oncol. 2015;38(6):610-620. Hoppe BS, Hodgson DC, Advani R, et al. ACR Appropriateness Criteria: localized nodal indolent lymphoma. Oncology (Williston Park). 2013;27(8):786-794. Terezakis SA, Metzger ML, Hodgson DC, et al. ACR Appropriateness Criteria pediatric Hodgkin lymphoma. Pediatr Blood Cancer. 2014;61(7):1305-1312. Guss ZD, Terezakis SA. Substance or style? Evaluating advanced radiation therapy delivery techniques for Hodgkin lymphoma. Appl Rad Oncol. 2016;5(2):5-10. Dr. Guss is a resident in radiation oncology, Johns Hopkins University School of Medicine, Baltimore, MD. Dr. Terezakis is associate professor, Department of Radiation Oncology and Molecular Radiation Sciences, Sidney Kimmel Comprehensive Cancer Center at Johns Hopkins.